Love the beauty, we havecwell water so now after 3 yrs the glass is discoloring at the drain. Add an elegant accent to your bathroom with the KRAUS vessel sink and faucet combo, featuring a tempered glass sink paired with a Waterfall faucet. Clean, classically-inspired lines create a striking look that will instantly enhance any bathroom style. Subtle variations will occur from piece to piece, adding to its unique qualities. Measurements may vary slightly. Dimensions 17.0 In. X 17.0 In. X 6.0 In. I saw a vessel sink at a bed and breakfast that we stayed in for our anniverasry weekend and I had asked where they purchased the sink from, they told me Overstock.com.. I love this vessel sink and faucet! I saw this and knew that I wanted to do a beach theme in my guest bathroom. Its absolutely beautiful!!! Absolutely love this vessel sink!!! It was shocking at first sight - windex blue- color theme, but when mounted on a charcoal grey and glass top vanity it looks like it was made for each other because of the dark blackish rim around the sink. Remarkably bold statement, but received many many compliments on this sink! No regrets. beautiful, well made, easy to install. it absolutely makes my bathroom look gorgeous. I will recommend this to anyone. you will love it, your friends will love it and want to buy one like it. 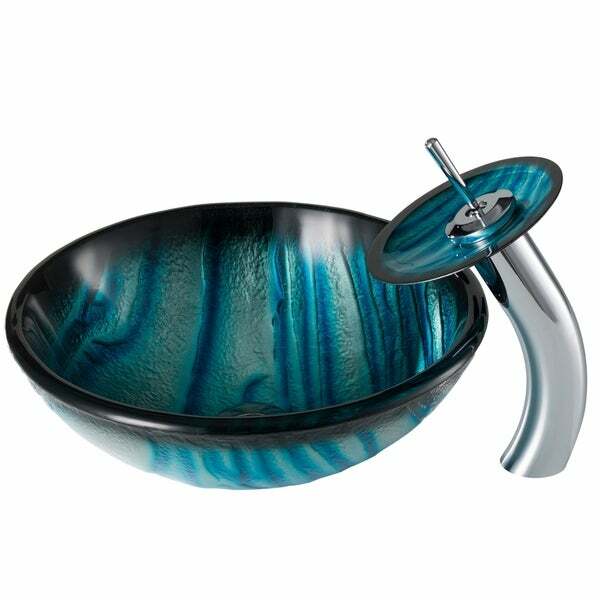 The Kraus vessel sink is gorgeous! Actually, much better looking when I opened the box, which was well insulated and all the parts were there. This is my second vessel sink I purchased from Krauss. I love the glass vessel sinks! They are a showcase for any bathroom! We have not started reinvention on our second bath yet. I will post a photo when installed. Thank you Krauss company for an outstanding product! Also, the color of the grey is more silver then what you see in the photo, its stunning! 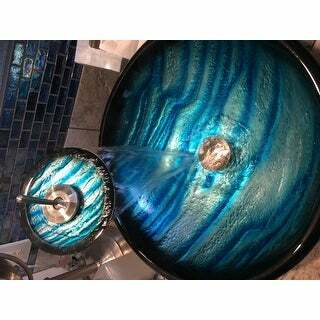 This sink is absolutely beautiful. I put it on a dark blue vanity with a white quartz top and it "pops". The waterfall faucet gives it such an expensive look (don't tell that it wasn't!!) The plumbers were impressed with the quality and price too. We love this beautiful addition to our bathroom, but I had no idea how the water fall spout would make it easier to wash my face. And the sink does not show water spots or soap spots much. We do have soft water. If you want to expand your horizons a little, go for it!! This sink is absolutely gorgeous in person. I was so excited to find it on this site. The colors are so bright. The heardware is pretty and durable. It was the perfect thing to complete the look of my bathroom! Mind blowing look a jewel really. "Does a pop up drain assembly come with sink and faucet combo?" Hello Cul, yes, this sink does included a pop up drain assembly. The pop up comes in a variety of finishes. Thank you for shopping with us. Loved the color and I have been looking for months and since I had a coupon I decided to buy today. I saw it at a friend's house and loved it !